Pretzel Logic's Market Charts and Analysis: SPX and NDX Update: 10-7-11; A little more room to run? SPX and NDX Update: 10-7-11; A little more room to run? There is an interesting scenario developing between the Nasdaq 100 (NDX) and the S&P 500 (SPX). The NDX appears to have completed its 1st wave down well ahead of the SPX. Obviously, we're not likely to see a situation where the NDX drops 600 points while the SPX rallies -- so the SPX has some "catching up to do," so to speak, to bring the two indices into similar positions. As you can see from the updated chart (below), the NDX has tracked that projection amazingly well -- however, we are again facing a scenario where the NDX is leading the SPX by a bit too much. 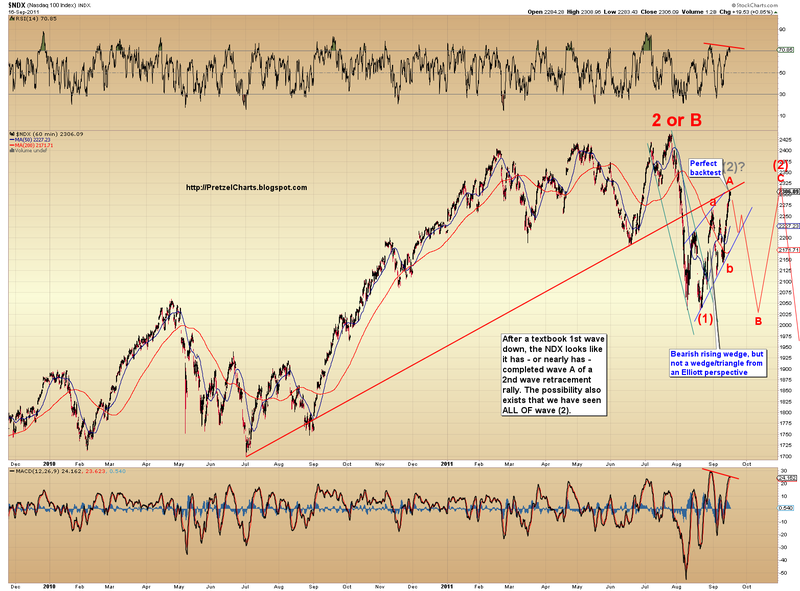 If my preferred count for the SPX is correct, we should have a decent rally on our hands. My expectation is that the SPX is in the process of forming the first leg of that rally. At some point we should have a nice scary correction down, then one more leg up to complete the rally, and thus complete a 3-wave move. The NDX has already completed its first leg up and 2nd leg down (A and B), and is now on its 3rd leg up. So how can we reconcile the two indices? The most obvious solution would be if the NDX is forming what's called a "triple zigzag." A triple zigzag consists of a 3-wave move (in this case: up), labeled (w); followed by an intervening drop, labeled (x); followed by another 3-wave move up, labeled (y); followed by another drop, labeled (x) again; followed by one more 3-wave move up, labeled (z). In the NDX chart above, this scenario is represented by the gray lines (the red lines show the NDX would drop hard below the recent lows once this rally completes -- the gray lines adjoin the red and show the path it would take instead of continuing to drop). Since we are talking about the NDX, I want to share one more chart quickly, this time of the Nasdaq Composite (below) before we move on to the SPX. 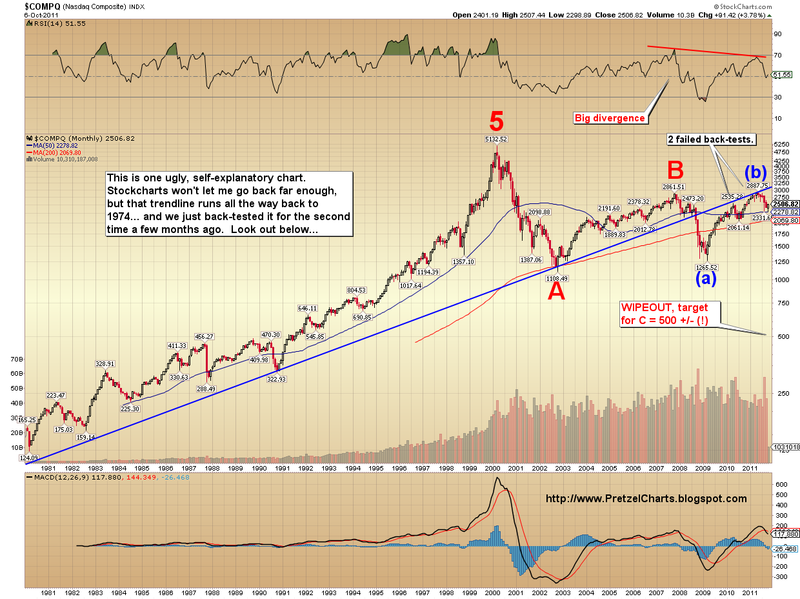 This chart shows a long term view of the Nasdaq, which I originally posted a couple weeks ago. What the chart doesn't show is that the blue trendline runs all the way back to 1974. We have now back-tested that trendline twice and failed to rally above it, which is a pretty bearish sign for the Composite. On to the S&P 500. The SPX validated my call from yesterday's update, when I wrote: In a perfect world, we would see [the SPX] at least tag the 1150's before completion, although it looks like it might even want to reach all the way up to tag the top line of the ending diagonal (in blue, low 1160's). The SPX closed the day at 1164.97, right where the blue line of the diagonal crossed. The rally in the SPX is now reaching into territory where, if it doesn't reverse pretty quickly, we are likely seeing ALL OF wave A-up of Minor (2)-up unfold now. That scenario would also serve to speed things up in the SPX and give it a chance to catch the NDX -- again helping to bring the two into comparable positions. 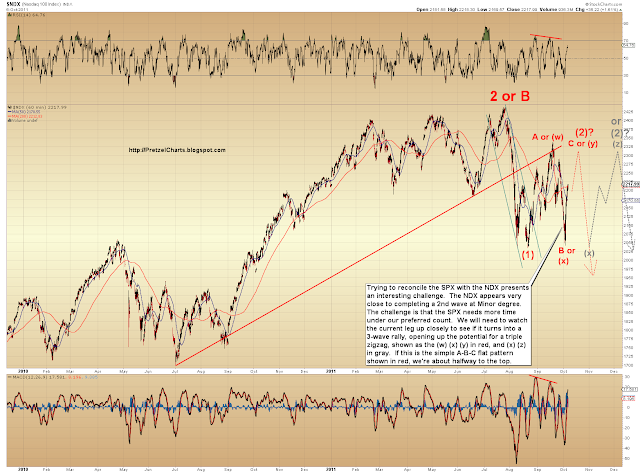 I have posted a new chart below to reflect the possibility that ALL OF wave A is unfolding now. For an alternate view, see yesterday's chart. Other than the two falling trendlines, there doesn't seem to be much in the way of resistance for the SPX until we reach the prior wave iv high at 1195. 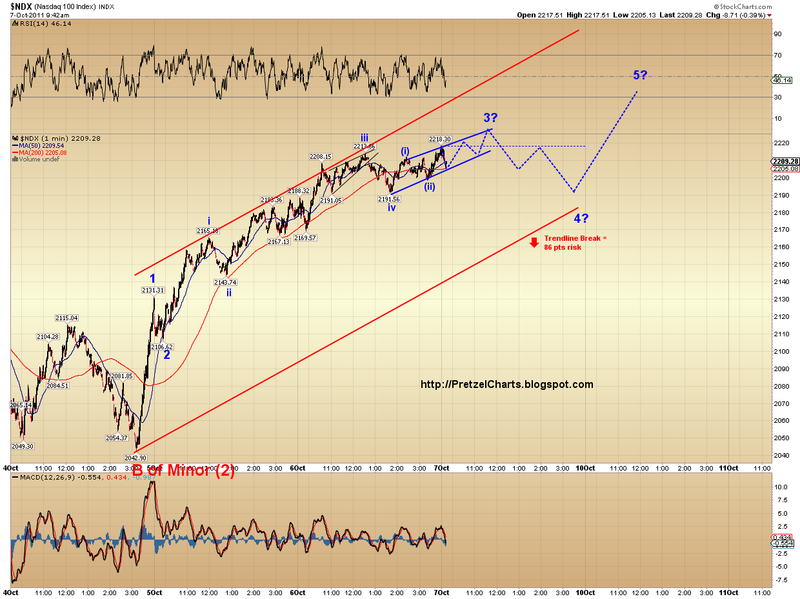 So, if the count for the short-term NDX chart is correct, the SPX should follow a similar track. NDX 100 ended 2day @ 2,202 pretty much following the blue line you had projected on the 3rd graph (ocy 4-11 time frame) for 2day (oct7). 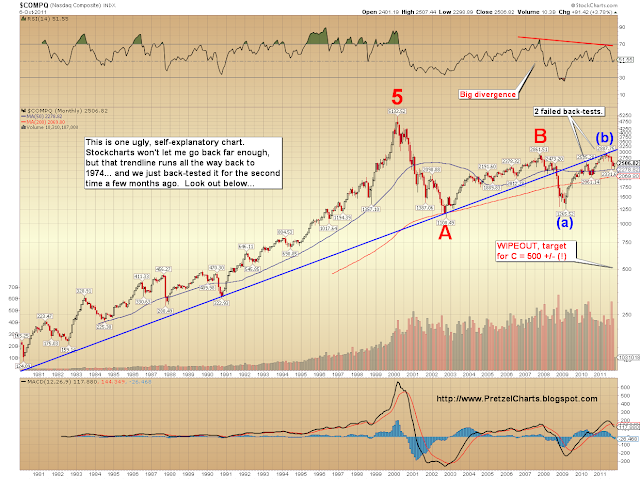 question is: did we see the (y) wave as hypothesized above? No clear indication so far. 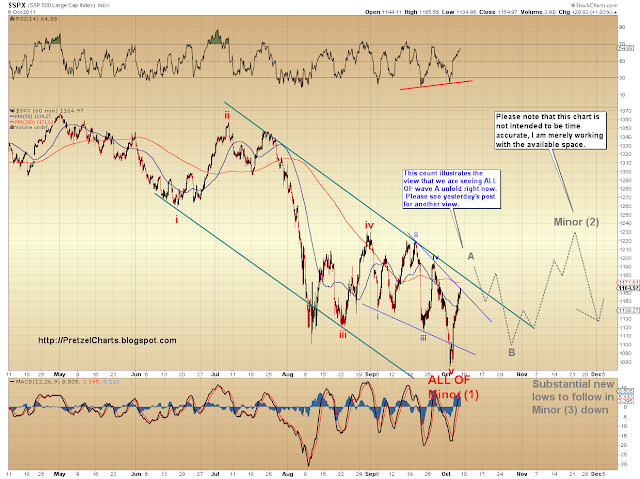 If we are seeing wave (y), it should break down into a large 3-wave move. We probably won't know for sure one way or the other until it's nearing completion.